Although you might think that traffic tickets are mainly for failing to obey traffic signs, you should know that you can also get a traffic ticket for failing to follow a police officer’s directions while on the road. 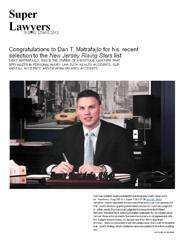 In this article, New Jersey traffic ticket attorney Dan T. Matrafajlo explains what you need to know if this happens to you. This means that a police officer has the power to give you a traffic ticket if you fail to abide by any of his commands, verbal or physical, which pertain directly to the enforcement of traffic laws. An example is if the officer directs you to proceed in a certain manner (such as going through an intersection, going around an accident scene, or going around flares), but you fail to comply. If this happens, the police officer can give you a ticket for failing to obey the direction of a police officer under N.J.S.A. 39:4-57. If you plead guilty or are convicted for N.J.S.A. 39-4-57 violation in court, you will get penalized by the New Jersey Motor Vehicle Commission (MVC), which will add 2 points to your driving record. This is important to note, because if you get 6 or more points on your driving record within a short period of time, your license will be suspended by the New Jersey Motor Vehicle Commission for at least 30 days. An addition of points on your driving record could also mean that your auto insurance rates will go up; a New Jersey licensed Automobile Insurance provider will add two “Insurance Eligibility Points” on your insurance record.